Corporate profit tax revenues have collapsed following the passage by Congress last December of the Trump-endorsed Republican tax plan. And this is not because corporate profits have decreased: They have kept going up. The initial figures, for the first half of 2018, show federal corporate profit taxes (also referred to as corporate income taxes) collected have fallen to an annual rate of roughly just $150 billion. This is only half, or less, of the $300 to $350 billion collected (at annual rates) over the past several years. See the chart above. The estimates on corporate profit taxes actually being paid through the first half of 2018 come from the National Income and Product Accounts (NIPA, and commonly also referred to as the GDP accounts) produced by the Bureau of Economic Analysis. The figures are collected as part of the process of producing the GDP accounts, but for various reasons the figures on corporate profit taxes are not released with the initial GDP estimates (which come out at the end of the month that follows the end of each quarter), but rather one month later (i.e. on August 29 this time, for the estimates for the April to June quarter). The quarterly estimates are seasonally adjusted (which is important, as tax payments have a strong seasonality to them), and are then shown at annual rates. While we already saw such a collapse in corporate tax revenues in the figures for the first quarter of 2018 (first published in May), it is always best with the estimates of GDP and its components to wait until a second quarter’s figures are available to see whether any change is confirmed. And it was. This initial data on what is actually now being collected in taxes following the passage of the Republican tax plan last December suggests that the revenue losses will be substantially higher than the $1.5 trillion over ten years that the staff at the Joint Committee on Taxation (the official arbiters for Congress on such matters) forecast. Indeed, the plunge in corporate profit tax collections alone looks likely to well exceed this. On top of this, there were also sharp cuts in non-corporate business taxes and in income taxes for those in higher income groups. This blog post will look at what the initial figures are revealing on the tax revenues being collected, as estimated in the GDP accounts. The focus will be on corporate income taxes, although in looking at the total tax revenue losses we will also look briefly at what the initial data is indicating on reductions in individual income taxes being paid. The chart above shows what the reduction has been in corporate profit taxes in dollar terms. In the next section below we will look at this in terms of the taxes as a share of corporate profits. That implicit average actual tax rate is more meaningful for comparisons over time, and it has also plunged. And the implicit actual rate now being paid, of only about 7% for the taxes at the federal government level, shows how misleading it is to focus on the headline rate of tax on corporate profits of 21% (down from 35% before the new law). The actual rate being paid is only one-third of this, as a consequence of the numerous loopholes built into the law. The Republican proponents of the bill had argued that while they were cutting the headline rate from 35% to 21%, they were also (they asserted) ending many of the loopholes which allowed corporations to pay less. But in fact numerous loopholes were added or expanded. The next section of the post will then look at this in the longer term context, with figures on the implicit corporate profit tax rate going back to 1950. The implicit rate has fallen steadily over time, from a rate that reached over 50% in the early 1950s, to just 7% now. While Trump and his Republican colleagues argued the cut in corporate taxes was necessary in order for the economy to grow, the economy in fact grew at a faster pace in the 1950s and 1960s, when the rate paid varied between 30 and 50%, than it has in recent decades despite the now far lower rates corporations face. But this is for the federal tax on corporate profits alone. There are also taxes on corporate profits imposed at the state and local level, as well as by foreign governments (although such foreign taxes are then generally deductible from the taxes due domestically). This overall tax burden is more meaningful for understanding whether the overall burden is too high. But, as we shall see below, that rate has also fallen steadily over time. There is again no evidence that lower rates lead to higher growth. The final substantive section of the post will then look more closely at the magnitude of the revenue losses from the December bill. They are massive, and based on the initial evidence could very well total over $2 trillion over ten years for the losses on the corporate profit tax alone. The losses from the other tax cuts in the new law, primarily for the wealthy and for non-corporate business, will add to this. A very rough estimate is that the losses in individual income tax revenues may total an additional $1 trillion, bringing the total to over $3 trillion. This is double the $1.5 trillion loss in revenues originally forecast. But first, an analysis of what we see from the initial evidence on what is being paid. 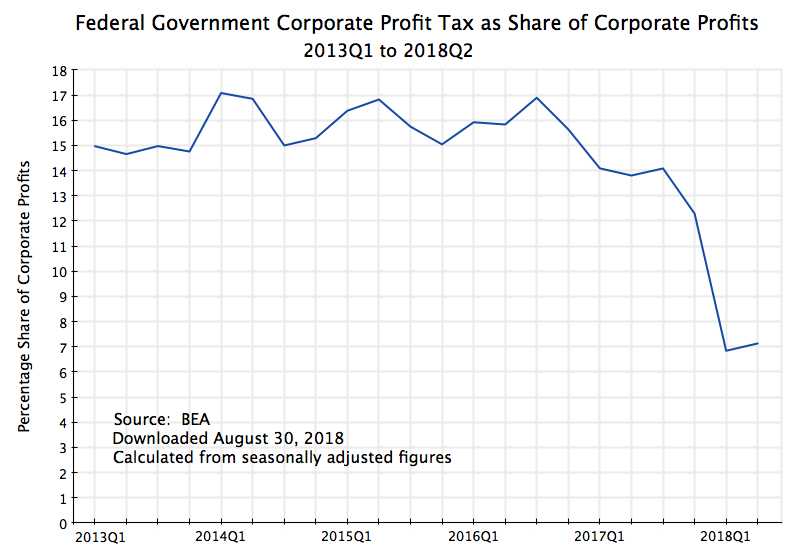 The chart at the top of this post shows what has been collected, by quarter (but shown at an annual rate), by the federal tax on corporate profits over the last several years. Those figures are in dollars, and show a fall in the first half of 2018 of a half or more compared to what was collected in recent years. But for comparisons over time, it is more meaningful to look at the implicit corporate tax rate, as corporate profits change over time (and generally grow over time). And this can be done as the National Income and Product Accounts include an estimate of what corporate profits have been, as part of its assessment of how national income is distributed among the major functional groups. Between 2013 and 2016, the implicit rate (quarter by quarter) varied between about 15 and 17%. It came down to about 14% for most of 2017 for some reason (possibly tied to the change in administration in Washington, with its new interpretation of regulatory and tax rules), but one cannot know from the aggregate figures alone. But the rate then fell sharply, by half, to just 7% after the new tax law entered into effect. A point to note is that the corporate profit figures provided here are corporate profits as estimated in the National Income and Product Accounts. They are a measure of what corporate profits actually are, in an economic sense, and will in general differ from what corporate profits are as defined for tax purposes. Thus, for example, accelerated depreciation allowed for tax purposes will reduce taxable corporate profits. But the BEA estimates for the NIPA accounts will reflect not the accelerated depreciation allowed for tax purposes, but rather an estimate of what depreciation actually was. Thus the figures as shown in the chart above will be a measure of what the true average corporate tax rate actually was, before the adjustments made (as permitted under tax law) to arrive at taxable corporate profits. That average rate is now just 7%. That is only one-third of the headline rate under the new law of 21%. Provisions in the tax code allow corporations to pay far less in tax than what the headline rate would suggest. This is not new (the headline rate previously was 35%, but the actual average rate paid was just 15 to 17% between 2013 and 2016, and 14% in most of 2017). But Trump administration officials had asserted that many of the loopholes allowing for lower taxes would be ended under the new tax law, so that the actual rate paid would be closer to the headline rate. But this clearly did not happen. As many independent analysts pointed out before the bill was passed, the new tax law had numerous provisions which would allow the system to be gamed. And we now see the result of that in the figures. In the early 1950s, the federal tax on corporate profits (actually paid, not the headline rate) reached over 50%. While it then fell, it kept to a rate of between about 30% and 50% through the 1950s and 60s. And this was a period of good economic growth in the US – substantially faster than it has been since. A high tax rate on corporate profits did not block growth. Indeed, if one looked just at the simple correlation, one might conclude that a higher tax on corporate profits acts as a spur to growth. But this would be too simplistic, and I would not argue that. But what one can safely conclude is that a high rate of tax on corporate profits does not act as a block to more rapid growth. There have also been important distributional consequences, however. Corporate wealth is primarily owned by the wealthy (duh), and the sharp decline in taxes paid on corporate profits means that a larger share of the overall tax burden has been shifted to taxes on individual incomes, which are primarily borne by the middle classes. Based on figures in the NIPA accounts, in 1950 taxes on individual incomes (including Social Security taxes) accounted for 47% of total federal taxes, while taxes on corporate profits accounted for 35% (with the rest primarily various excise taxes such as on fuels, liquor, tobacco, etc., plus import duties). By 2017, however, the share of taxes on individual incomes had grown to 87.4%, while the share on corporate profits had declined to just 8.6%. There was a gigantic shift away from taxes on wealth to taxes on individual incomes – taxes that are borne primarily by the middle class. And that share will now fall further in 2018, by about half. The chart above is for federal corporate profit taxes alone. It could be argued that what matters to growth is not just the corporate profit taxes paid at the federal level, but all such taxes, including those paid at the state and local level, as well as to foreign governments (although the taxes paid abroad are generally deductible on their domestic taxes, so that will be a wash). This follows the same path as the chart for federal corporate profit taxes alone, with a similar decline. With the federal share of such taxes averaging 84% over the period (up to 2017), this is not surprising. The federal share will now fall sharply in 2018, due to the new tax law. 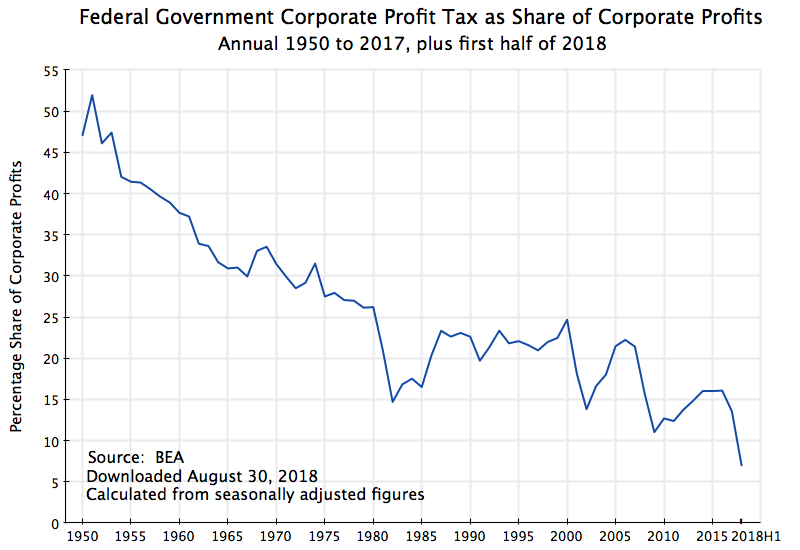 But over the 1950 to 2017 period, the chart covering all taxes on corporate profits is basically a close to proportionate increase over what the tax has been at the federal level alone. 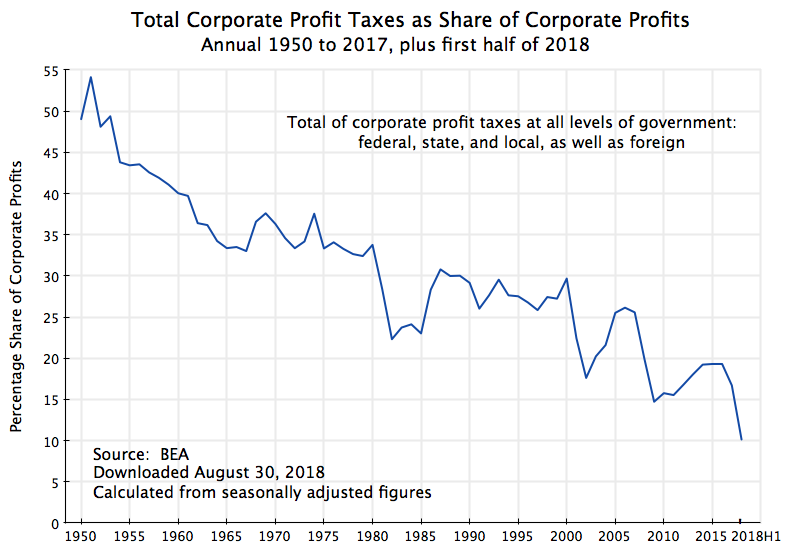 So the same pattern holds, and the total of the taxes on corporate profits varied between 33% to over 50% in the 1950s and 60s, to between 15 and 20% in recent years before the plunge in the first half of 2018 to just 10%. But the relatively high taxes in the 1950s and 60s did not lead to slow growth in those years, nor did the low taxes in recent decades lead to more rapid growth. Rather, one had the reverse. These initial figures on the taxes actually being paid following the passage of the Republican tax bill allow us to make an estimate of what the revenue losses will turn out to be. These will be very rough estimates, as we only have data for half a year, and one should be cautious in extrapolating this to what the losses will be over a decade. But they can give us a sense of the magnitude. And it is large. As we will see below, based on the evidence so far the revenue losses (from the cuts in both corporate taxes and in personal income taxes) might be over $3 trillion over ten years, or about double the $1.5 trillion loss estimate originally forecast. First, for the federal taxes on corporate profits, as the largest changes are there: As was discussed before (and seen in the charts above), corporate profit taxes paid as a share of corporate profits were relatively flat between 2013 and 2016, varying between 15 and 17% each quarter, before falling to 14% for most of 2017. For the full 2013 to 2017 period, the simple average was 15.3%. The implicit rate then fell to just 7.0% in the first half of 2018. 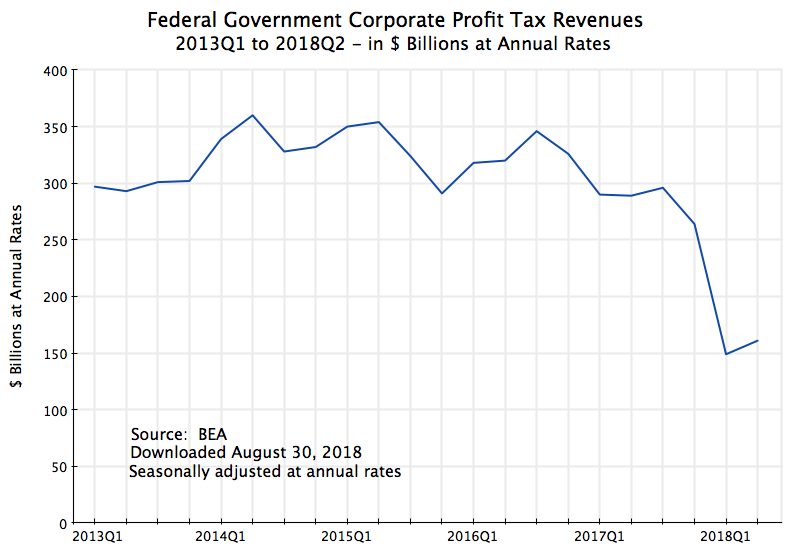 Had the rate instead remained at 15.3%, corporate profit taxes collected in 2018 would have been $184 billion higher (on an annual basis). This is not small, and is twice as high as the estimate of the staff of the Joint Committee on Taxation of revenue losses of $91 billion in FY2019 (the first full year under the new tax regime) from all the tax measures affecting businesses (including non-corporate businesses, and covering both domestic business and overseas business). It is three times as high as the estimated loss of $60 billion in FY18, but the new tax law did not affect the first quarter of FY2018 (October to December). One should be cautious with any extrapolation of this loss estimate going forward, as not only is the time period of actual experience under the new tax regime short (only a half year), but the law is also a complicated one, with certain provisions changing over time. But a simple extrapolation over ten years, based on the assumption that corporate profits grow at just a modest 3% a year in nominal terms (meaning 1% a year in real terms if inflation is 2% a year), and that the tax rate on corporate profits will be 7.0% a year (as seen so far in 2018) rather than the 15.3% of recent years, implies that the reduction in corporate profit tax revenues will sum to about $2.1 trillion. Note that the losses would be greater (everything else equal) if the assumed growth rate of corporate profits is higher. But the results are not very sensitive to this. The total losses over ten years would be $2.2 trillion, for example, at an assumed nominal growth rate of 4% (i.e. with inflation still at 2%, then with corporate profits growing at 2% a year in real terms, or double the 1% rate of the base scenario). Note this also counters the argument of some that such tax cuts will lead to such a large spurt in growth that total tax collections will rise despite the cut in the rates. As will be discussed below, there is no evidence that this has ever been the case in the US. But even assuming there were, the argument is undermined by the basic arithmetic. In the example here, a doubling of the assumed growth rate of profits (from 1% in real terms to 2%) would imply taxes on corporate profits would still fall by $2.0 trillion over the next ten years. This is not far from the $2.1 trillion loss if there is no rise at all in the growth of corporate profits. And a doubling of the real growth rate is far above what anyone would reasonably assume could follow from such a cut in the tax rate. Second, there were also substantial cuts in individual income taxes, although primarily for the wealthy. While far less in proportional terms, the substantially higher taxes that are now paid by individuals than by corporations means that this is also significant for the totals. Specifically, individual (federal) income taxes as a share of GDP in the NIPA accounts were quite steady in the quarterly GDP accounts for the period from 2015Q1 to 2017Q4, varying only between 8.22% and 8.44%. The average was 8.31%. But then this fell to an average of 7.89% in the first half of 2018 (7.90% in the first quarter, and 7.87% in the second quarter). Had the rate remained at 8.31%, then $86 billion more in revenues (at an annual rate) would have been collected. Extrapolating this out for ten years, assuming again just a modest rate of growth for GDP of 3% a year in nominal terms (i.e. just 1% a year in real terms if inflation is 2% a year), the total loss would be $1.0 trillion. With a higher rate of growth, and everything else the same, the losses would again be larger. This extrapolation is, however, particularly fraught, as the Republicans wrote into their bill that the cuts in individual taxes would be reversed in 2026. They did this to keep the forecast cost of the tax bill to the $1.5 trillion envelope they had set, and an effort is already underway to make this permanent (Speaker Paul Ryan has said he will schedule a vote on this in September). But even if we left out the tax revenue losses in the final two years of the period, the losses in individual taxes would still reach about $0.8 trillion. Adding the lower revenues from the taxes on corporate profits and the taxes on individual incomes, the total revenue losses would come, over the ten years, to about $3 trillion. This is double the $1.5 trillion loss that had been forecast. It is not a small difference. To give a sense of the magnitude, the loss in 2018 alone (a total of $270 billion) would allow a doubling of the entire budgets (based on FY2017 actual outlays) of the Departments of Education, Housing and Urban Development, and Labor; the Environmental Protection Agency; all international assistance programs (foreign aid); NASA; the National Science Foundation; the Army Corps of Engineers (civil works); and the Small Business Administration. Note I am not arguing that all of their budgets should necessarily be doubled (although many should, indeed, be significantly increased). Rather, the point is simply to give readers a sense of the size of the revenues lost as a consequence of the tax cut bill. As another comparison to give a sense of the magnitude, just half of the lost revenue (now and into the future) would suffice to fund fully the Social Security Trust Fund for the foreseeable future. If nothing is done, the Social Security Trust Fund will run out at some point around 2034. Republicans have asserted that nothing can be done for Social Security except to scale back (already low) Social Security pensions. This is not true. Just half of the revenues that will be lost under the tax cut bill would suffice to ensure the pensions can be paid in full for at least 75 years (the forecast period used by the Social Security trustees). But as noted above, proponents of the tax cuts argue that the lower taxes will spur growth. This has been discussed in earlier posts on this blog, where we have seen that there is no evidence that this will follow. There are not only basic conceptual problems with this argument (a misreading of basic economics), but also no indication in what we have in fact observed for the economy that this has ever been the case (whether in the years immediately following the major tax cuts of Reagan or Bush, nor if one focuses on the longer term). Administration officials have not surprisingly argued that the relatively rapid pace of growth in the second quarter of 2018 (of 4.2% at an annual rate in the end-August BEA estimates) is evidence of the tax cut working as intended. But it is not. Not only should one not place much weight on one quarter’s figures (the quarterly figures bounce around), but this followed first-quarter figures which were modest at best (with GDP growth of an estimated 2.2% at an annual rate). But more fundamentally, one should dig into the GDP figures to see what is going on. The argument that tax cuts (especially cuts in corporate profit taxes) will spur growth is based on the presumption that such cuts will spur business investment. More such investment, especially in equipment, could lead to higher productivity and hence higher growth. But growth in business investment in equipment has slowed in the first half of 2018. Such investment grew at the rates of 9.1%, 9.7%, 9.8%, and 9.9% through the four quarters of 2017 (all at annual rates). It then decelerated to a pace of 8.5% in the first quarter of 2018 and to a pace of 4.4% in the second quarter. While still early (these figures too bounce around a good deal), the evidence so far is the exact opposite of what proponents have argued the tax cut bill would do. So what might be going on? As noted before, there is first of all a good deal of volatility in the quarterly figures for GDP growth. But to the extent growth has accelerated this year, a more likely explanation is simple Keynesian stimulus. Taxes were cut, and while most of the cuts went to the rich, some did go to the lower and middle classes. In addition, government spending is now rising, while it been kept flat or falling for most of the Obama years (since 2010). It is not surprising that such stimulus would spur growth in the short run. The problem is that with the economy now running at or close to full capacity, such stimulus will not last for long. And when it was needed, in the years from 2010 until 2016, as the economy recovered from the 2008/09 downturn (but slowly), such stimulus measures were repeatedly blocked by a Republican-controlled Congress. This sequence for fiscal policy is the exact opposite of the path that should have been followed. Contractionary policies were followed after 2010 when unemployment was still high, while expansionary fiscal policies are being followed now, when unemployment is low. The result is that the fiscal deficit is rising soon to exceed $1 trillion in a year (5% of GDP), which is unprecedented for a period with the economy at full employment. We now have initial figures on what is being collected in taxes following the tax cut bill of last December. While still early, the figures for the first two quarters of 2018 are nonetheless clear for corporate profit taxes: They have fallen by half. Corporate profit taxes paid would be an estimated $184 billion higher in 2018 had the tax rate remained at the level it had been over the last several years. While this post has not focused on personal income taxes, they too were cut. The reduction here was more modest – only by about 5% overall (although certain groups got far more, while others less). But with their greater importance in overall federal tax collections, this 5% reduction is leading to an estimated $86 billion reduction in revenues (in 2018) from this source. Based on what has been observed in the first two quarters of 2018, the two taxes together (corporate and individual) will see a combined reduction in taxes paid of about $270 billion in 2018. Extrapolating over ten years, the combined losses may be on the order of $3 trillion. These losses are huge. And they are double what had been earlier forecast for the tax bill. Just half of what is being lost would suffice to ensure Social Security would be fully funded for the foreseeable future. And the rest could fund programs to rebuild and strengthen the physical infrastructure and human capital on which growth ultimately depends. Or some could be used to reduce the deficit and pay down the public debt. But instead, massive tax cuts are going to the rich. This entry was posted in Fiscal Issues and tagged policy, tax system, taxes, Trump by aneconomicsense. Bookmark the permalink.